In less than one week we have seen not one, not two, but three birds entangled in OLD fashioned barb wire fencing. The first bird came in to the Citrus County Rehab Facility that we work very closely with, Nature’s World Wildlife Rescue, on Wednesday last week. We had volunteers at the facility picking up birds that were ready for release when a great horned owl came in with several inches of barb wire attached. The volunteers quickly jumped into action and were able to remove the wire and begin treating the bird. The second bird we saw was also a great horned owl. This one came to us via a Florida Wildlife Commission referral. 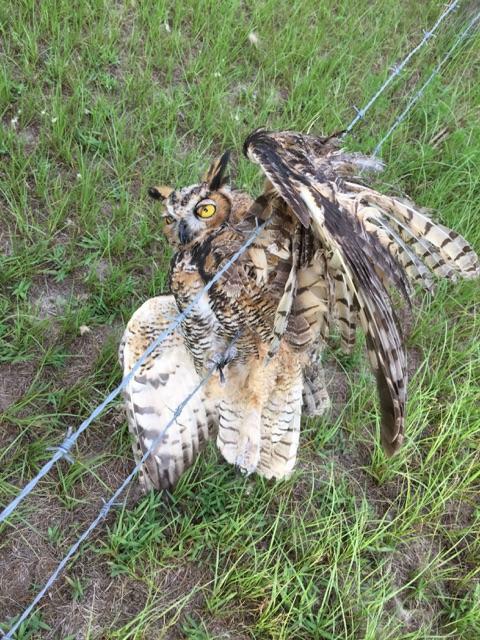 The juvenile owl had become entangled in a Zephyrhills family’s fence near their horses. When they went out to check on the horses Monday afternoon they were shocked to see their resident owl stuck in the fence. 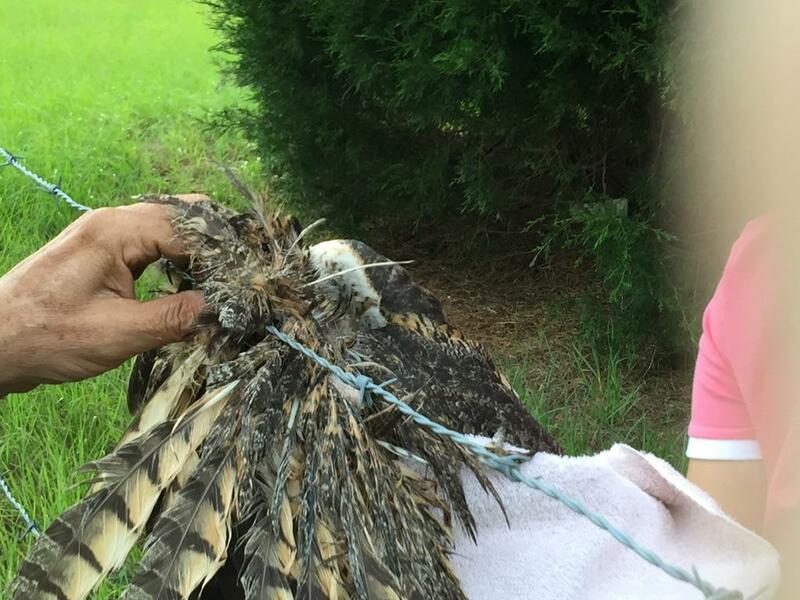 They were able to carefully cut the owl out of the fence but were unable to remove all of the wiring that had become imbedded in his wing while he struggled to get unstuck before they found him. After we received the call we were able to bring him in and start treatment to stabilize him and took him in to see the vet staff at Busch Gardens early the next morning. Luckily the Busch Gardens team was able to remove the wire and further examination and Xrays showed that there were no broken bones, however they is some damage to the tendons. We expect this bird to make a full recovery and be released in the future. However the road to recovery is not always an easy one and there is still a risk of infection so, he will remain under observation until he has healed completely. 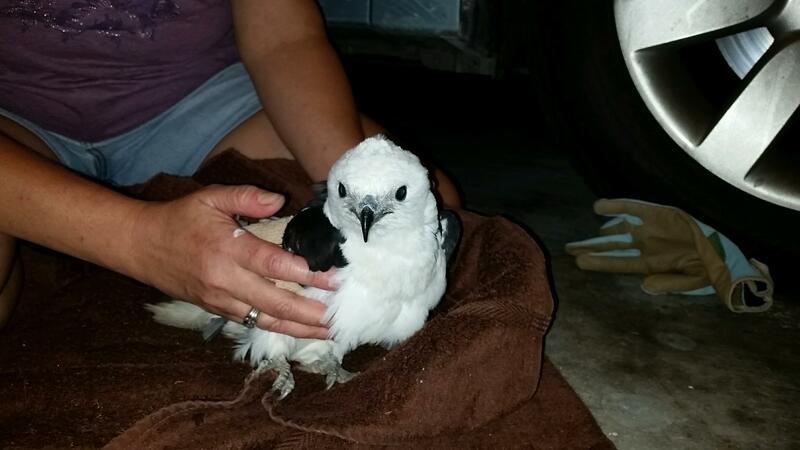 The third bird was picked up by one of our transporters yesterday in Dade City. We had received a frantic call about an osprey caught in yet another barb wire fence. 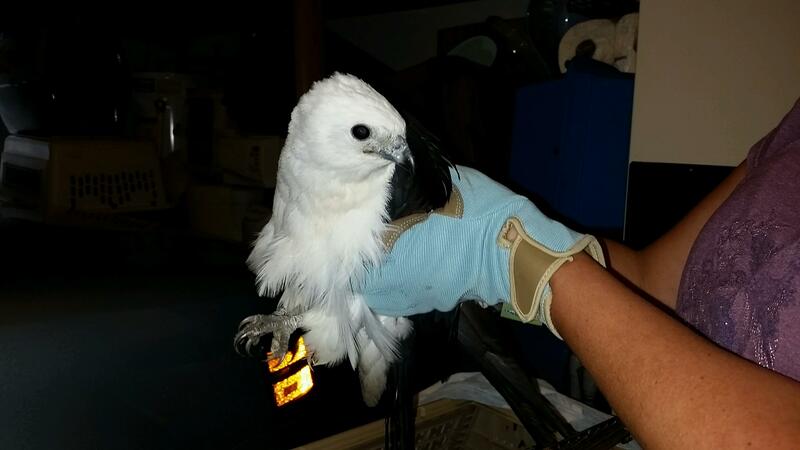 When our transporter arrived however he was surprised to find that it was not an osprey that was tangled in the fence but rather a rarer swallow-tailed kite who was able to get loose from the fence however was unable to fly. 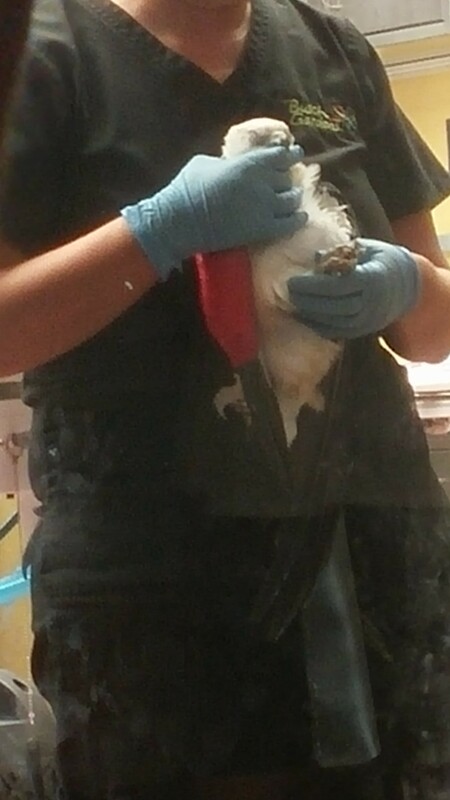 It was brought in immediately and treatment was started to stabilize the bird. Today she was taken to Busch Gardens as well for treatment and unfortunately there is extensive damage to the wing. It appears that this bird may have been stuck for a couple of days before it was discovered. She not only has irreversible damage been done to the muscles and tendons in her wing, she is also very weak from being without food and water for a few days. Due to the extreme damage she will not be able to ever be returned to the wild which is always what we aim for. In her case however this does NOT mean she will be euthanized. Sometimes when we have animals that are not able to be released we are still able to provide them a high quality life as an educational ambassador for their species. Busch Gardens will do everything in their power to save her life while we work to find her a permanent home at a facility where she can live and work share her story and help teach others about her rare species. Barb wire fences have a purpose in many areas where livestock are present, however there are many other options that may be a safer solution. We encourage anyone with barb wire fence or debating on installing one to do their research and see what other materials may be available. If updating a barb wire fence on your property is not currently an option please make sure to check it often for animals that may have become tangled as time is of the essence in these cases. Not only is there a risk of injury when caught but they are also at risk of dehydration and starvation. If you happen to find an animal in trouble please make sure you report it to a licensed rescue facility like Owl’s Nest Sanctuary for Wildlife so that it can receive the care and treatment it needs. We also ask that you consider making a donation to Owl’s Nest Sanctuary for Wildlife so that we may continue our work. Make sure to follow our blog for updates on theses cases and others like them!